When the tape drive requires cleaning, the front panel will display the cleaning light. Periodic cleaning is not recommended unless you are experiancing problems. Clean the LTO drive in usual operation only when the cleaning light is displayed. Note: Some software applications may notify you that the tape drive requires cleaning. Refer to your backup software documentation for more information. Apply power to the LTO tape drive and wait for the power-on self-test to complete. Insert the LTO cleaning cartridge into the tape drive. The cleaning cycle is performed automatically and takes approximately two minutes. When the cleaning cycle is complete, the LTO tape drive ejects the cleaning cartridge and the cleaning light is no longer displayed. Note: If there are no more cleaning cycles remaining on the cleaning cartridge, the tape drive ejects it without performing the cleaning. Confirm that a cleaning was completed by making sure that “Cleaning error” is no longer displayed. 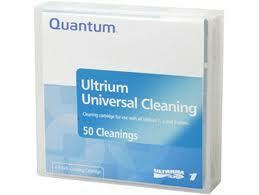 Store the LTO cleaning cartridge for future use if there are less than 50 cleaning cycles performed. To clean your LTO drive, use only LTO Cleaning Cartridges for use with LTO drives. CAUTION: Do not use any cleaning method other than the LTO Cleaning Cartridge for use with LTO drives. Using other cleaning methods not approved by SQS will void the tape drive’s warranty. If an LTO cleaning tape has expired, the cleaning light will fail to go out and the cleaning tape will be ejected without a cleaning cycle being performed. A failure to correctly designate a slot as a cleaning slot when a cleaning tape is inserted may cause your library to load the cleaning cartridge every time the library performs an inventory (depending on config). This can have the effect of over cleaning the tape drive and shortening the drives life. If you require more information about this issue, please call us now on 08450 666 222 where our engineers can best advise you as to configuration and backup strategy options for your specific library and software combination. Looking for LTO cleaning cartridge tapes? Click here to go to our online store.